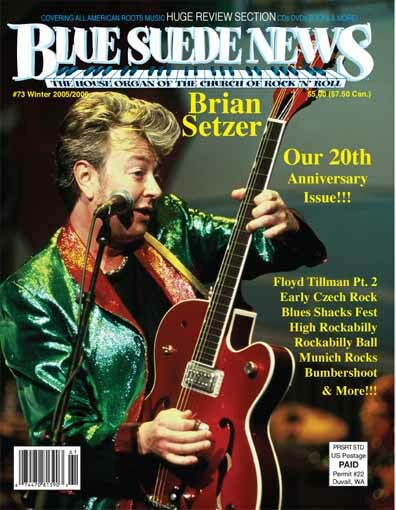 Blue Suede News Magazine- Rockabilly, Blues, Honky Tonk Country, 1950s Rock'n'Roll, American Roots music covered since 1986! or Reverse logo on Black (L, XL, XXL) - just $15 ppd in the U.S. of A.! Check Out Our Jukebox Fever Compilation!! Click here to buy new Homegrown Music DVD!!! Scroll down to see our latest cover! Pdf editions are readable on nearly any computer and also most tablet devices and smart phones as well! You can also order any 4 pdf editions from #57 - #108 PLUS #1,#6, #7, #8, #10, #11, #16, #17, #30 and #31 if you specify the issues you want with your subscription order, or e-mail that to us. 68 page issues #40 - #56 (#56 is 60 pages) are now also available in pdf for $7.50! Order single copies to the right, at the bottom below the sample copy links. The project of digitizing the back issues in ongoing and we may have at least started it, or be willing to do it next if you want to buy it! Latest Issue in PDF form (or any issue #57 - 112 plus issue #1, #6, #7, #8, #10, #11, #16, #17, #30 & #31) by e-mail, only $5.00 anywhere in the world! Subscribe! 1st Class Mail Subscription in envelope ($26) by Paypal! First Class Mail Subscription WITH DIGITAL subscription ($30) by Paypal! Click here to order a U.S. Bulk Mail Subscription ($22) by Paypal! Bulk Mail Subscription WITH DIGITAL subscription ($26) by Paypal! Canada- $30 Click here to order a Canadian Subscription by Paypal! Canadian Subscription WITH DIGITAL subscription ($34) by Paypal! Europe, etc.- $38 air Click here to order an Air Mail Subscription by Paypal! Airmail Subscription WITH DIGITAL subscription ($42) by Paypal! Digital Subscription ($18) link to left below picture. Link for sample copy below. you-name-it hybrids. Basically, anything we like. none other covers the whole spectrum in the way we do. and occassionally other products relating to music. We review around 100 CD/DVD/Book titles in each issue! Click to Order a sample copy in the U.S. or Canada & pay now; using Paypal! Click here to order a Sample Copy by airmail and pay now; through Paypal! 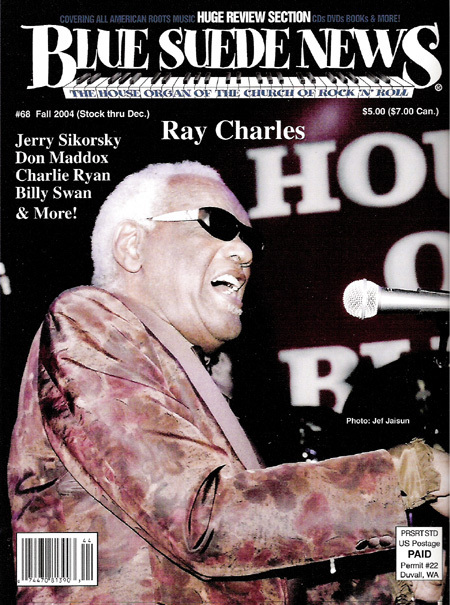 Click here to order our latest Issue in PDF form only $5.00 anywhere! Now is a great time to order complete back issue sets! We will be raising the price from $280.00 to $300.00 starting June 1 because issue #45 is now out of print, and the reprints are expensive! Issue #48 will also be out of print and only available in reprint very soon - as will #9! Buy a Blue Suede News T-shirt! Check Our New CD Sale Page! We receive many letters from readers who appreciate that our reviews are informative, trying to stroke neither artists' nor the writers' egos. We try to get to the heart of the matter--why someone would want to own the product--rather than making too many value judgements. 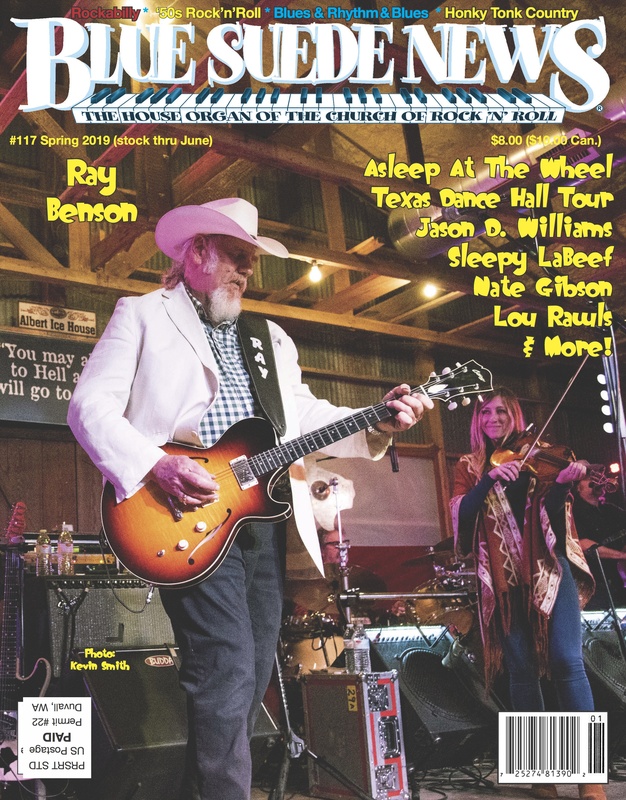 Blue Suede News #117 has a cover story on the Texas Dance Hall Tour and Asleep At The Wheel founder Ray Benson, another on a recent show with Sleepy LaBeef and Jason D. Williams (both with lots of pictures), an interview with Rockabilly and Roots artist Nate Gibson whose new project finds him singing with several Stars of Starday Records, an extensive story on Soul/Blues artist Lou Rawls, and a shorter piece on The Red Elvis Dean Reed, plus regular features Thrift Store Scores and The Original Versions are also here along with our extensive reviews section covering Books, DVDs, CDs and Vinyl! E-mail BSN Contact us for information on subscriptions, Back Issues, or BSN Merchandise. Canada- $30 Click here to order a Canadian Subscription and pay now; through Paypal! Europe, S. America- $38 air Click here to order an Air Mail Subscription and pay now; through Paypal! Japan- $35 air / Australia- $38 air Click here to order an Australia or Japan Subscription and pay now; through Paypal! Sample copy, U.S., Canada- $7.00 Click here to order a Sample Copy in the U.S. or Canada and pay now; through Paypal! Sample Copy, Outside U.S.- $10.00 Click here to order a Sample Copy by airmail and pay now; through Paypal! Last 2 issues, Outside U.S.Click here to order the Last Two Issues by airmail and pay now; through Paypal!- $16.00 Jap/Aus $16.00 Click here to order the Last Two Issues by airmail in Australia or Japan and pay now; through Paypal! Office hours: Noon - 8pm (PST), but call anytime, we'll get back to you! And we now take PayPal! Click Here To Order Back Issues!! You'll also get the pdf editions by e-mail - they have 4 more pages of content than print!
. Click here to order a U.S. Bulk Mail Subscription ($22) and pay now; through Paypal! Here's a banner link for your website! Select and copy the html below! Paste into your html source code at the point where you want it to appear on your links page!